Proprietary Name: Wal-dryl Pe Allergy Plus Congestion What is the Proprietary Name? Non-Proprietary Name: Diphenhydramine Hcl, Phenylephrine Hcl What is the Non-Proprietary Name? 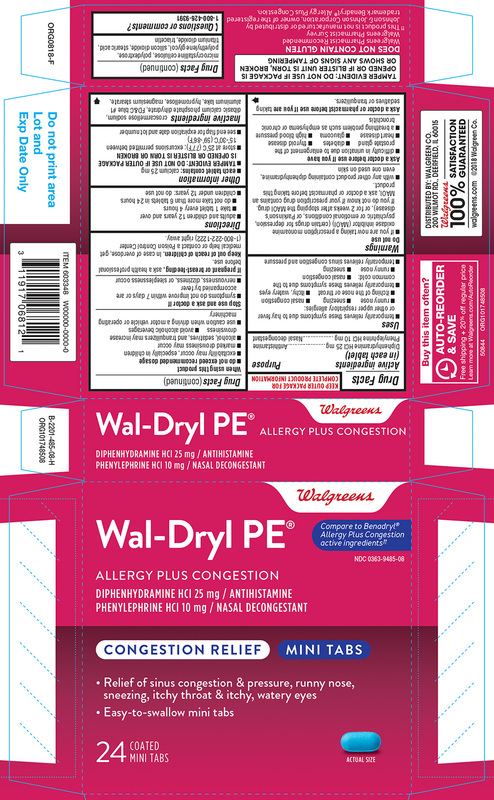 Wal-dryl Pe Allergy Plus Congestion with NDC 0363-9485 is a a human over the counter drug product labeled by Walgreen Company. The generic name of Wal-dryl Pe Allergy Plus Congestion is diphenhydramine hcl, phenylephrine hcl. The product's dosage form is tablet, film coated and is administered via oral form.